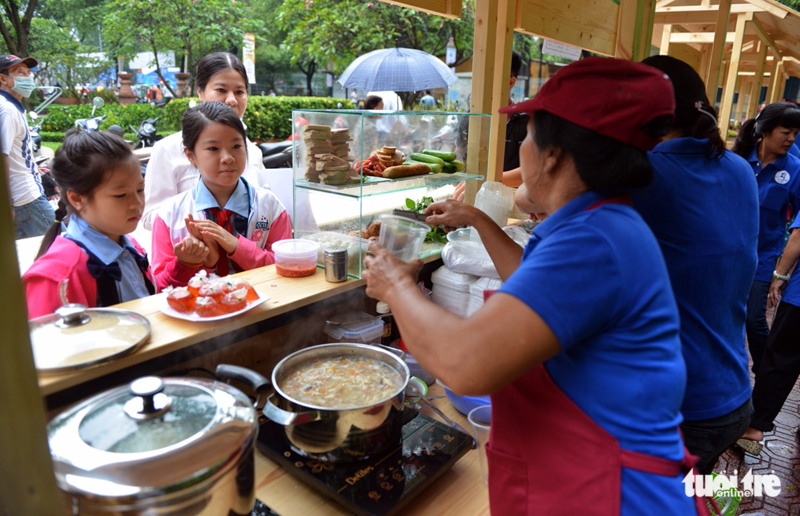 A second ‘food street’ opened on Monday morning in Ho Chi Minh City, one month after the launch of the first. The new food hub is located at the Bach Tung Diep Park in District 1, bordered by Nam Ky Khoi Nghia and Ly Tu Trong Streets. The 30-meter food street houses up to 30 catering businesses run by former street vendors, who take turns to occupy the stalls in two shifts: between 6:00 am and 9:00 am, and from 11:00 am to 2:00 pm. The food street is the second of its kind to be opened in the southern metropolis, following a months-long crackdown on sidewalk-encroaching street vendors headed by Doan Ngoc Hai, deputy chairman of District 1. The city’s first food street was launched on August 28 along Nguyen Van Chiem Street, which lies between the Youth Culture House and Diamond Plaza, connecting Pham Ngoc Thach and Hai Ba Trung Streets in District 1. While the Nguyen Van Chiem food street only offers takeaways, there are tables and parasols available at the Bach Tung Diep food street for diners to enjoy their meal nearby. Food safety and hygiene are the number-one priorities a both streets, with all vendors undergoing a compulsory training course, according to Tran The Thuan, chairman of District 1. Doan Ngoc Hai was present at the opening day of the Bach Tung Diep food street on Monday morning to hand out lucky money and wish the vendors a profitable year. A representative from District 1’s administration said the district would permit night shifts in the near future to meet the varied demands of diners in the city. The sidewalk clearance campaign began earlier this year after Hai took it upon himself to enforce the district’s often-ignored sidewalk occupancy laws. Taking note of the campaign’s positive reception from local citizens, other neighborhoods in Ho Chi Minh City had begun following suit until the initiative came to a sudden end in late March. Hai marked the campaign’s return with a surprise crackdown on August 9, issuing fines to multiple cars and taxis parked illegally on sidewalks and confiscating tables and chairs from eateries occupying the pavements.